The job of a Venue Manager is to handle all issues related directly to the buildings and grounds. Problems with the air conditioning, plumbing, lighting, water on the floor, no toilet paper in the bathroom, etc. These are the types of things that should be reported to the Venue Manager. A good Venue Manager is close at hand and easy to find if an issue arises. 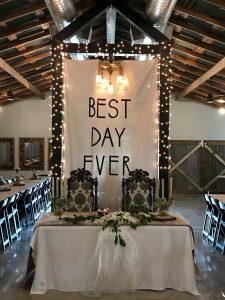 A Day of Coordinator is the person who keeps the wedding or event as stress-free as possible by taking care of all other types of issues that might arise. She should oversee everything from the wedding to the reception; ensuring that everyone is in the right place at the right time according to the timeline. She should direct the vendors, answer questions from the guests and see that the bridal couple’s wishes are followed. A good Day of Coordinator will take care of the logistics and let the bridal couple enjoy the stress free wedding they are hoping for.